Mitch Caron ends his four-year Spartan career throwing for 25 touchdowns and 4,428 total yards. Victory! After suffering their closest loss of the season versus Dean College (19-17) on Saturday Nov. 3, the Spartans rebounded with a 21-3 win over Alfred state on Saturday Nov. 10. Emotions were running high after Castleton’s second win of the season. But just a week earlier, the team’s spirits were at an all-time low. Few players or coaches were willing to comment. A week later the Spartans did exactly that. It was clear right out of the gate the Spartans were the more energized team. Players and coaches could be seen bouncing around the sideline, making plenty of noise. The Spartans came out fired up, and it showed in their play. It was a dominant performance from Castleton from start to finish. Thanks to a 92-yard run from Moe Harris with two minutes left in the first half, the Spartans came into the third quarter with a 14-0 lead. Although the final score may not indicate a blowout, this was a huge game for the Spartans. The Nov. 10 game against the Pioneers was the final game of 18 different Spartans college careers. It also marked the fewest points allowed by Castleton in any game this season, and it couldn’t have come at a better time. This senior day win saved the 2018 Spartans from tying the program-worst record of 1-9 (2013). “I’m very happy for our seniors who have represented our program in the highest manner both on and off the field during their four years,” said head coach Tony Volpone. But Volpone wasn’t the only one commending his team after the win. “You have no idea, after such a hard season, I couldn’t be any more proud of the team,” said senior linebacker and captain Grant Cummings. Cummings led the way defensively for the Spartans against the Pioneers with eight total tackles; two pass breakups, and a fourth-quarter interception. 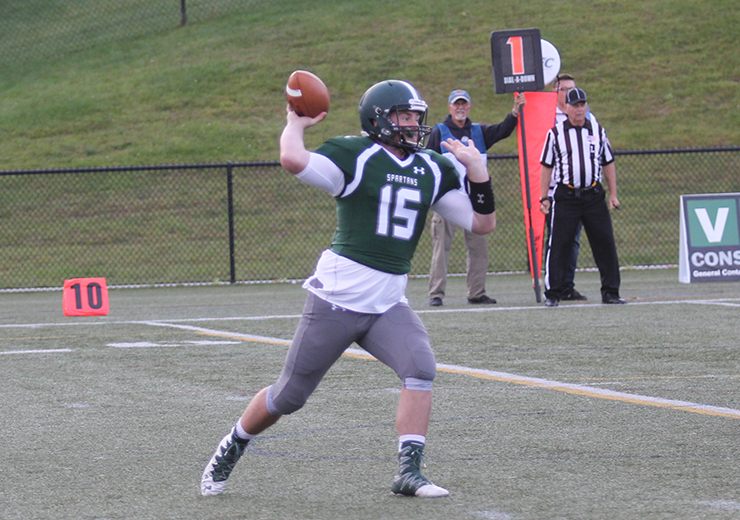 Although Castleton finished just 2-8, the final victory allowed them to cap the season off on a positive note. “We made so many key plays to contribute to that win and it was a perfect way to end my senior season,” Cummings said. After all, the season wasn’t a total waste for the Spartans. Just a week prior, senior running back Moe Harris became Castleton’s all-time leader in all-purpose yardage in a loss to the Dean College Bulldogs. He set the record with 5,555 total yards, surpassing previous record holder Kevin Alberque (5,473 yards). He proceeded to bury the record with an additional 189 total yards in his final game against Alfred State. The season also saw sophomore defensive end Chris Rice shatter Castleton’s single-season tackle for loss record with 22.5 this season (previous record: 15) and tied the career record for TFLs with 28. Rice also tied the single-season sack record during the Spartans 2018 campaign. This season has been a bumpy road for the Spartans, but luckily for them, there was a light at then end of the tunnel.